It's that time of year again, and the tills at Amazon and ebay have been cashing in, as home school mums across the globe go into a frenzy getting next years supplies ready....and I am no exception. This week we've had several (okay, maybe more) packages arrive with new books, as well as a trip to the shops fill up on sharpies, felt tip pens and glue sticks.......rows upon rows of brightly coloured stationary....I love it! After unwrapping all our new books, I thought it could be helpful to share our curriculum choices for this year. Although I have to admit, we have never been good at sticking consistently to a curriculum style book before we loose interest, other than Math U See which we have stuck to because of its open and go ease. 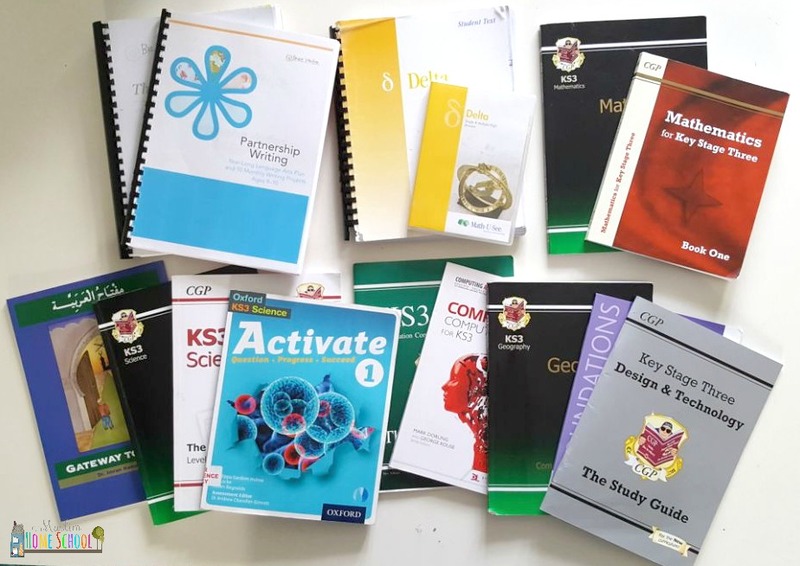 Throughout primary for my eldest, we have pretty much done what we wanted, dipping in and out of various books and projects as we pleased. However now she is entering year 7, I kind of feel I might need to have some sort of structure or program to follow a little more thoroughly....to a degree. I'm planning on putting up a more detailed review of each of our book choices and how exactly we are using them in the coming weeks inshaAllah, so please do look out for those, however today I just wanted to share what will be on our shelf, forming the core of our "curriculum" this year. Islamic Studies: Is still undecided. Right now we are working on a summer project about women in Islam for a weekend class they attend. So for the next few weeks that is what we are spending our time working on. After E'id we will start something inshaAllah, but I am still looking into what yet. Gateway to Arabic book 2. Geography: Project work supported by various non curriculum books, although we did get CGP Geography Revision & practice to use as a guide. 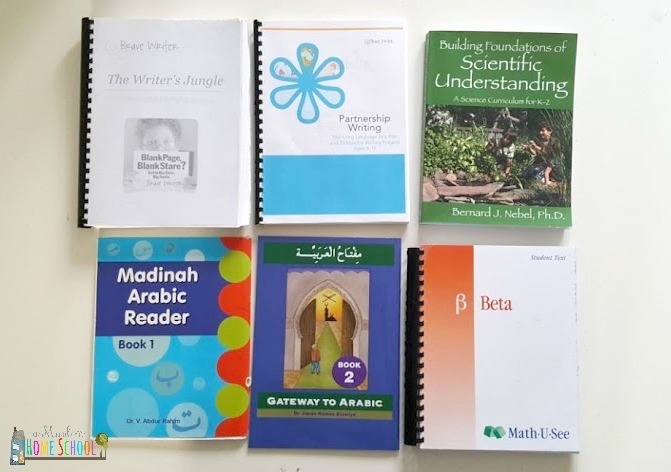 We have decided to try a type of tuition this year, with a small circle of home school girls once a week, covering English, History, Geography and Islamic Studies. I believe she will benefit from being part of a group, in ways that she won't necessarily get from just me. She is getting older, and I would like her to have the opportunity to work with her peers to bounce and share ideas that I think will aid her own learing development bi'ithnillah. We will see how she goes, and if it is not the right fit then I won't push her to continue. But I would like her to try it out as I do think she really will enjoy it and gain a lot from the experience inshaAllah. My youngest is technically now Year 4. However, I am not at all interested in looking at year graded curriculum through primary. Our main focus this year will be to continue developing her writing, reading and maths skills in a way that helps nurture a love of learning inshaAllah. She will be doing the same as her sister for Islamic Studies, Arabic and English (refer to title links listed above) just working at her own level. I think that pretty much lists our main "schooly" books. I am not at all an A-type home schooler, so I know we aren't going to be using all these books 100% conventionally. If you jump over onto Instagram you will see we have started a few scrapbooks this summer rather than working in typical notebooks. It will be interesting to see what happens this year in our studies. 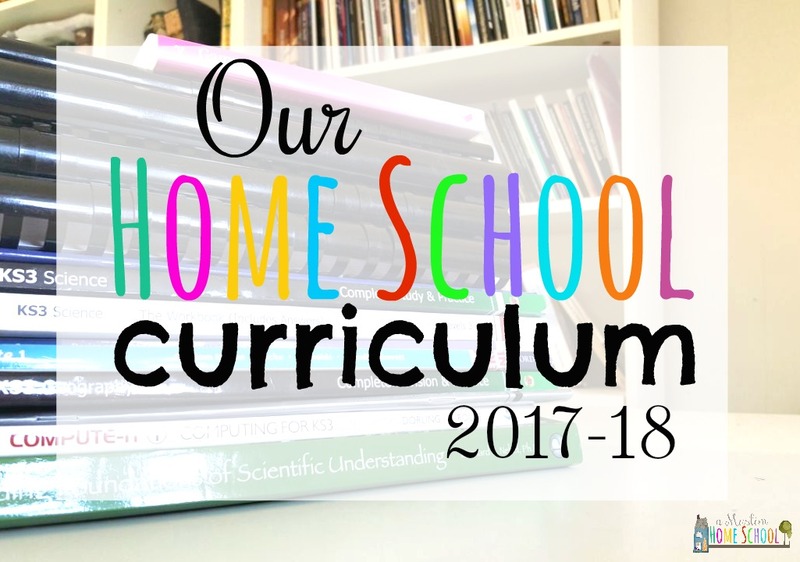 Starting Secondary with my eldest feels a bit like we have started home schooling all over again from the beginning.....just when I thought we had it all figured out, we are back to square one, taking a big wide leap into the unknown.